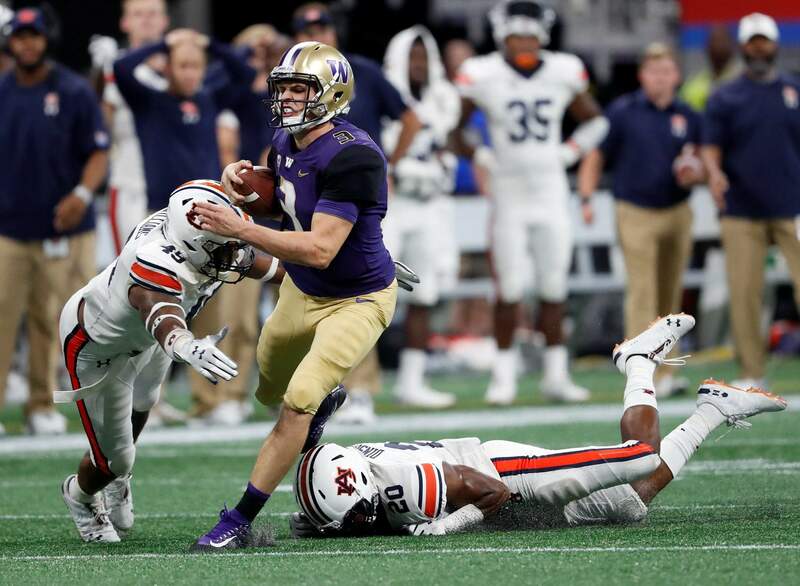 Washington quarterback Jake Browning (3) is stopped by Auburn’s Darrell Williams (49) and Jeremiah Dinson (20) after running for a first down during the second half Saturday in Atlanta. Auburn won 21-16. 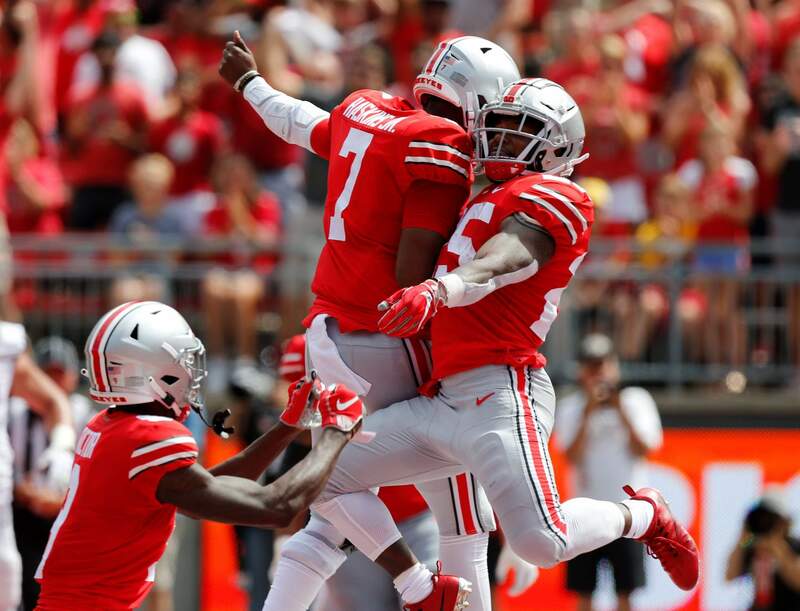 Ohio State running back Mike Weber, right, and quarterback Dwayne Haskins celebrate Weber’s touchdown against Oregon State during the first half of a game Saturday in Columbus, Ohio. 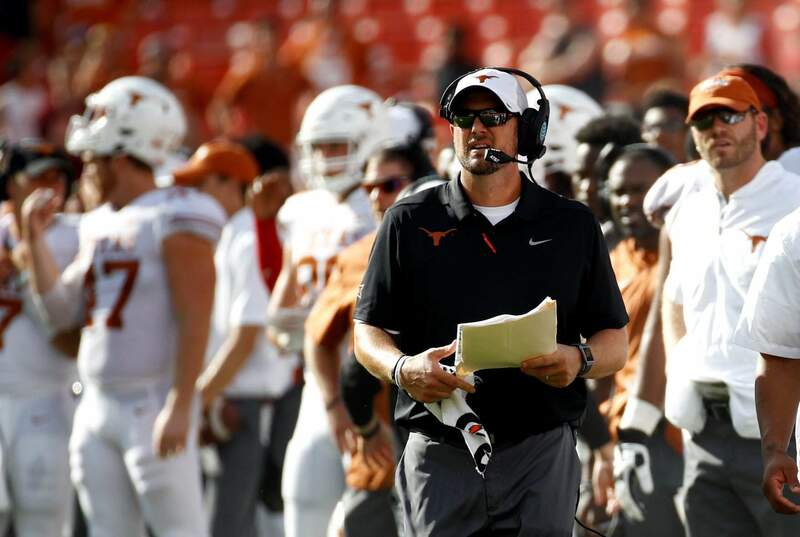 Texas head coach Tom Herman walks on the sideline in the second half of a college football game against Maryland on Saturday in Landover, Md. Washington lost the game the Pac-12 needed to win. At least that’s how the showdown with No. 9 Auburn was billed all offseason. As a neutral site that was anything but, the sixth-ranked Huskies lost a sloppy rock fight of a football game in Atlanta on Saturday , the only top-10 matchup of the first full weekend of the season. Coming off a 1-8 bowl season and the second playoff shutout in four years, the Pac-12 needed an early boost to repair some of its tattered reputation. The Huskies came up short in a flurry of red-zone failures, but writing off the entire conference is probably premature – especially Washington. We should learn from history. In the first season of the playoff, the Big Ten was left for dead two weeks into the season when Virginia Tech beat Ohio State at home and Oregon beat Michigan State. The Buckeyes didn’t lose again and won the national title. It is hard to see the Huskies going on that type of run. For all of Jake Browning’s accuracy and toughness, the senior quarterback’s physical limitations do seem to get exposed against top-flight competition. But to dismiss the idea that Washington could run the Pac-12 table seems silly. And to think that another Pac-12 team could sweep through to a conference championship at 12-1 and that a close loss by Washington on the other side of the county without its star left tackle (Trey Adams was out with a back injury) would tip the scales against the whole league does not add up. Especially if Auburn contends in the Southeastern Conference. There is a lot of football to be played. Patience, please. Though if you’re a Michigan fan, it is understandable that your patience is running low. The first full weekend of the regular season provided a few thrills and surprises. Here are the takeaways. ANOTHER BIG GAME FLOPAnother prominent offseason story line was quarterback Shea Patterson’s arrival at Michigan, and how the former five-star recruit could transform the Wolverines’ offense. There were a few flashes of Patterson’s athleticism and arm talent against Notre Dame , but mostly Michigan’s offense looked much as it did last year. The Wolverines scored one offensive touchdown. Michigan is now 9-9 in its last 18 games under coach Jim Harbaugh and 1-6 against the teams it most wants to beat, Ohio State, Michigan State and Notre Dame. The slam-dunk hire, the beloved coached who returned to save his alma mater, is currently stuck in neutral. Michigan has a chance to get pointed in the right direction and rip off five consecutive victories, though that trip to Northwestern on Sept. 29 is no gimme. The Wolverines could be 5-1 and ranked when Wisconsin comes to town on Oct. 13. The next week they go to Michigan State. Win those and Saturday night’s loss at Notre Dame will look like nothing more than a case of growing pains for the new quarterback. But for the next six weeks there is nothing Michigan can do to make their fans feel better about the state of the program, its ability to reach an elite level again and the coach they thought would fix everything. DISTRACTION OR MOTIVATION?Trying to quantify how the turmoil at Ohio State could affect the Buckeyes on the field will be virtually impossible. Most likely, the narrative will be retrofitted to the results. If Ohio State loses a few games, especially that big one against No. 16 TCU in a couple weeks, and comes up short of a Big Ten championship game appearance, the suspension Of coach Urban Meyer could be the distraction that took the Buckeyes off their game. If Ohio State continues to hum along the way it did against Oregon State, the Meyer mess could be looked at as a galvanizing force that sharpened the team’s focus. “We’re playing for coach and we’re playing for each other and we took it out on the field today,” said Ohio State quarterback Dwayne Haskins, who passed for 313 yards and five touchdowns in the 77-31 victory. The bottom line is the Buckeyes have one of the most talented rosters in the country. Expect more of the same next week when Rutgers visits the Horseshoe. Meyer returns to practice this week, but will not be on the sideline for game day until Sept. 22 against Tulane. The week after that the Buckeyes go to No. 10 Penn State. TERRAPINS ON A MISSIONIf any team seemed primed to suffer on the field from preseason turmoil off it, it was Maryland. The Terrapins were also playing without their coach, DJ Durkin, after the death of teammate Jordan McNair during summer workouts led to reports players being mistreated and toxic culture in the program. The Terps looked like a team out to prove a point, beating Texas for the second consecutive season. After the 34-29 upset – if you want to call it that – the Terrapins celebrated by waving a flag with the number 79 on it, the number worn by McNair. Unlike the Meyer situation at Ohio State, Durkin’s status is still up in the air with no end in sight. What could become interesting is whether offensive coordinator Matt Canada can position himself as serious contender to replace Durkin if Maryland does clean house. The longtime OC is in his first season on staff so he won’t necessarily be tarnished by being associated with the old staff. Texas, still not back ... Alabama has won national titles with Greg McElroy and AJ McCarron at quarterback. Now, in Tua Tagovailoa, the top-ranked Crimson Tide might have the best quarterback in college football. Not fair. ... Eleven years to the day Appalachian State, still an FCS team at the time, beat No. 5 Michigan in the Big House, the Mountaineers pushed Penn State into overtime. The Nittany Lions hung on, but if there is a lingering concern for Penn State it is the rebuilt defense that allowed 6 yards per play ... Kyler Murray and Oklahoma will certainly face tougher opponents than Florida Atlantic, but the Sooners’ new starting quarterback gave glimpse of why points should still be plentiful for Lincoln Riley’s offense ... Chip Kelly lost his debut at UCLA to Cincinnati and will take his Bruins to Norman, Oklahoma, next week. Just getting to a bowl would be a win for Kelly this season.